Home/Blog/What’re The Advantages Of Laser Cutting ? Laser cutting is widely used in the processing of metal materials, which can greatly reduce the processing time and cost. The working principle of this process is that the laser beam is focused on the material which makes the material surface melted and then use the laser beam coaxial compressed gas blow away the melted material, through the relative motion of the laser beam and the path of the material to form a fixed shaped slit. 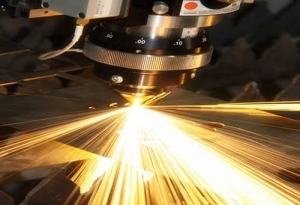 Laser spot of laser cutting is smaller, it has high energy density, faster cutting speed, so in the process of laser cutting can be harvested to better cutting quality. (1) laser cutting incision is generally narrow, both sides of incision are parallel and perpendicular to the surface, the size of the cutting parts precision can up to ± 0.05mm. (2) The cutting surface is smooth and beautiful, and the surface roughness can be guaranteed to be several tens of microns. In most cases, laser cutting can be used as the last process, and parts after laser cutting can be directly used. (3) After laser cutting, the material heat affected zone width is very small, material properties near the kerf is also almost unaffected. And the workpiece deformation is small, cutting precision is high, cutting geometry is good, the kerf cross-sectional shape appears as a regular rectangle. Laser has transmission characteristics, when the laser cutting machine is equipped with more than one CNC table, the entire cutting process can be controlled by CNC operation. When processing, just change the CNC program, suitable for cutting different shapes, it can achieves two-dimensional cutting or three-dimensional cutting. The torch does not come into contact with the workpiece directly during laser cutting, so there is no wear on the tool. For the processing of different shapes of parts, there is no need for “tool” replacement, only need to change the laser output parameters. Therefore, laser cutting equipment has lower equipment wear rate, lower noise, lower vibration and pollution-free in the processing. Assuming that the steel plate is 2mm thick and the laser cutting power is 1200W, the cutting speed can reach 15000px / min. When laser cutting clamping does not required, it can save fixture cost and save on the feeding of auxiliary time.